Why don’t we use yummy chewable joint supplements for dogs? Dogs love treats and I use them liberally, but when I designed our formulas I found that chewable joint (or probiotic) supplements might be tasty, but a tiny scoop of powder would provide up to a HUNDRED TIMES MORE supplement than treats or chews would allow. If this site does anything for pet owners, my hope is that it will educate you about the best ways to care for your pet. Joint surgery is prohibitively expensive, it's painful and if you can avoid it for your dog by using a powder instead of a joint chewable it just makes sense. My goal is to make you question the way you care for your pets, that you will do your homework and I’ll share information and links to the research and articles to help you make better more informed choices for your pets. For example, there is a silent epidemic of joint disease that is slowly crippling dogs by the millions. The Distemper Vaccine has been blamed along with neutering pets too early in the alarming rise in joint surgeries and the astonishing costs associated with those procedures. “Neutering, and the age at which a dog is neutered, may affect the animal’s risk for developing certain cancers and joint diseases, according to a new study of golden retrievers by a team of researchers at the University of California, Davis. The study, which examined the health records of 759 golden retrievers, found a surprising doubling of hip dysplasia among male dogs neutered before one year of age. "The study results indicate that dog owners and service-dog trainers should carefully consider when to have their male or female dogs neutered,” Benjamin Hart, Distinguished professor emeritus in the UC Davis School of Veterinary Medicine. You need to be proactive, especially if your pet was neutered before one year of age. Protect your pet early, daily and NOW for a lifetime of joint health. 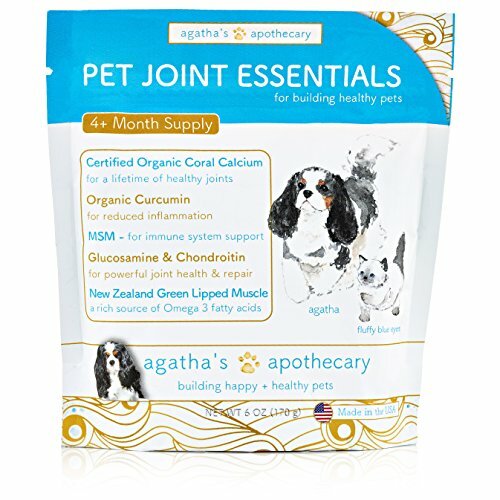 One scoop a day of this long-lasting and economical powerhouse supplement will help your pet’s joints both as a puppy & through to senior dog status! Active Ingredients per scoop (Included in the pouch). In a base of Organic (above sea level harvested) Coral Calcium.